"This is a refreshing drink much like lemonade." 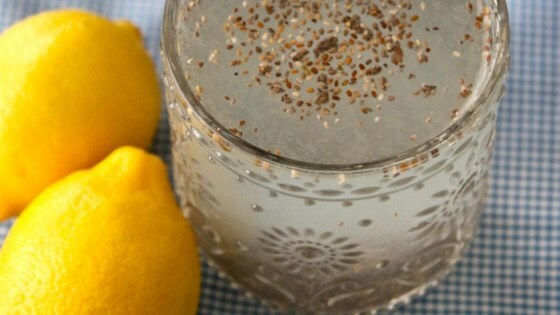 Stir water, lemon juice, and sugar together in a glass until sugar is completely dissolved; add chia seeds. Let stand until a gel forms around the chia seeds, about 10 minutes; stir. This was yummy and healthy. I was disappointed with the sugar so I substituted it with blue agave nectar instead and it tasted fine! Defiantly refreshing for a sip in the garden!! Refreshing on warm winter day - 82 degrees and Santa Ana winds blowing. Substituted organic raw honey instead of the sugar. Easy way to add fiber to your diet. I have a glass nearly every day. Like others, I use agave as my sweetener of choice. Thanks for the simple and tasty recipe! Nice and refreshing to drink outside. I really liked the lingering chia seeds in my mouth to crunch on.